Gambia: progress in policy implementation? Had the Economic Community of West African States (ECOWAS) remained neutral, Gambia would be in a civil war now. The policy of non-indifference, associated with the responsibility to protect (R2P), viewed by sceptics as a threat to sovereignty, is often applied with caution. In the 1960s, when the wave of independence was sweeping across Africa, the Organization for Africa Unity (OAU) crafted the non-interference policies as deterrence from the entanglement of the colonial past. This policy created an attitude of ‘sees no evil, say no evil.’ However, after the USA debacle in Somalia and the genocide in Rwanda, the adage ‘African solution to African problems’ emerged. By the time the African Union (AU) was formed this maxim catalysed the policy shift from non-interference to non-indifference. The spillover of conflicts to neighbouring states, often resulting in protracted refugee crises, had taught regional communities that development depended on security indifference and that indifference was a failed policy. Both development and security are equally important because the “so called state failure has dire local, regional, and global effects.” ECOWAS prevented such effects. Yahya Jammeh, the former dictator, surprised the world when he conceded defeat and congratulated Adama Barrow on winning the 2016 elections, but his body language raised suspicion. Threats to try his past crimes turned things around, a process that would have seen the Gambian ICC prosecutor Fatou Bensouda investigating home affairs. Jammeh insinuated that foreign interference rigged the election, rejected the results, and declared a state of emergency. ECOWAS heads of states moved swiftly pursuing a ‘diplomatic non-indifference,’ but Jammeh remained adamant. When this mediation failed, ECOWAS mobilized a ‘military non-indifference,’ but Jammeh threatened to fight them back as his Burundian counterpart Pierre Nkurunziza did in 2015 when the AU announce it would send peacekeepers after his controversial decision run for a third term. Although the Burundian crisis arguably differs from the Gambian, the EAC community were not unanimous in policy implementation nor were they politically willing to intervene. Burundi, one of the regional contributors of peacekeepers, with many in Somalia, threatened to recall their soldiers. The EAC and African Union quietly backed off, resulting to an influx of refugees to Tanzania and political assassinations from both divides. African politicians misused elections disputes to engineer power-sharing, with the incumbent often favoured. Unfortunately for Jammeh, the elections were declared free and fair by observers, and besides, the Supreme Court could not hear any petition before his term expired. 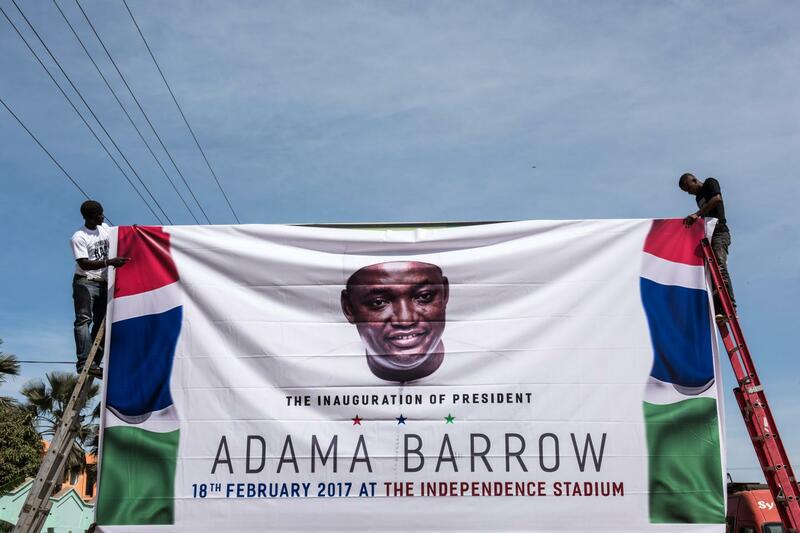 Barrow was sworn in Senegal, receiving domestic and international legitimacy, although amidst confusion by the parliament attempting to increase Jammeh’s term for three months. Surprisingly the Army stood by the people: a dead blow to Jammeh. His last tool of power was broken; he had to surrender but only when ECOWAS Mission in Gambia (ECOMIG) forces were advancing. Guinea and Mauritania used ‘carrot and stick’ giving room for a final diplomatic solution. Jammeh finally accepted a self-exile deal to Equatorial Guinea, looting the treasury but leaving the country in peace. Although Jammeh could not wrestle a united indifferent ECOWAS, this crisis indicates the feasibility of the policy of non-indifference. First, a move from a militaristic conception of security requires the participation of courageous citizens. They must stand up for elective positions without falling into the trap that elections are always rigged, a story that politicians worldwide use to gain power. Secondly, Track I diplomatic must be a priority when security is threatened. Regional leaders appear to be credible mediators as they are not too foreign to represent an out-of-region interest. A rather debatable point is the role of the military, trained to be loyal and neutral, or rather obey the government. Can the military exercise civil disobedience and what are the implications? Perhaps, the Gambian military was also a victim of Jammeh’s rule and were also in need of transition. Transitional justice mechanisms have often compromised justice, freeing rebels or dictators from crimes. Notably in Africa, the ICC (mis)interpreted as a tool for interference does not provide exit strategies such as the one crafted by ECOWAS. The peace versus justice debate indicates the ICC “exacerbate rather than diminish conflict by removing incentives for high‐level…mediation.” A robust diplomatic policy of non-indifference seems a viable alternative. African agency in security needs political will especially in the new world order, with increasing protectionists tendencies. The President of the Commission ECOWAS, Marcel de Souza expressed his satisfaction with the Gambian cases saying, “the operations took place without shedding of blood, without any casualty, and without any foreign intervention whatsoever. This is a clear indication that Africa can face her own challenges and find solutions to her problems.” The political will by all stakeholders in an economic community can avert disasters. The capacity and funding should no longer be an excuse, for external funding might be the very source of complicating the situation because of the apparent interference or the use of funding as a policy tool. In essence, for the policy of non-indifference to succeed, then unlike the politicised ICC, regional bodies must apply the policy with caution. The ‘developmentalization’ of security can no longer been ignored, that is “the recognition that security forces can, and should on occasion, contribute directly or indirectly to development.” Indeed, African peacekeepers such as ECOMIG are professional for most of their operations and can do more if supported. While it can be argued that the Gambian situation is a relative small, the fact remains that smaller models often provides a means for re-examining the bigger pictures. Development will only be possible if domestic, regional and international actors prioritise security and act proactively. Thus, non-indifference and R2P have similarities “to prevent, to react, and to rebuild.” African economic communities and AU must continue prioritising human security, by building up their own agencies. The Gambian case shows that this is possible. The non-indifference policy is gaining currency. Wirkwajie Eugine Wirba is a researcher and adjunct lecturer at the Catholic University of East Africa. He holds an MA in Peace Studies and International Relations from Hekima Institutes of Peace Studies and International Relations. His research interest is on socio-political issues and peacebuilding in Africa. Kerr, Pauline. “Human Security.” In Contemporary Security Studies, by Alan Collins, 121-135. New York: Oxford University Press, 2010. Gasper, Des. “Securing Humanity: Situating ‘Human Security’ as Concept and Discourse.” Journal of Human Development and Capabilities 6, no. 2 (2006): 221-245.